Bigger isn't always better, but in a 1967 Mustang fastback, some well placed additional length and width made for a better car in many ways. The added length improved the silhouette of the fastback Mustang, giving it a much more flowing look when viewed from the side. 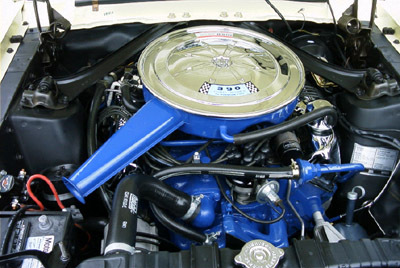 Increased width allowed for extra room in the engine compartment that was needed to widen the front suspension so that Ford engineers could squeeze in a potent big block 390 cubic inch V8 engine, allowing it to compete with its Dodge and Chevy rivals, the Charger, Challenger, and Chevrolet's Camaro and Chevelle. Style-wise, the 1967 Ford Mustang 2+2 is thought by many enthusiasts as being one of the best looking pony cars Ford ever made. And if you are on the hunt for a 67 fastback to restore, you have already found just how popular they are and how few of these cars are available at a reasonable price. If you're lucky enough to own one, you're in a pretty exclusive crowd. Only 71,042 Mustang fastbacks (15%) were made, out of a total production of 472,121. As you see in the pictures, changes were made to the Ford Mustang's silhouette from front to back. 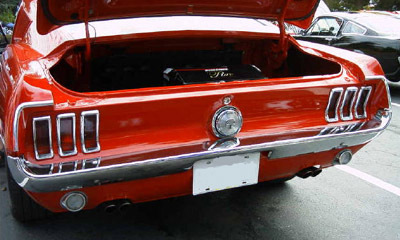 The rear end included new, concave tail lights and a restyled fastback tail section, which flowed into the rear window like it's bigger brother, the Ford Galaxie 500. The traditional, non functional side scoops behind the doors were restyled for the 1967 model year nd the rear 3/4 windows featured louvers. The front end styling retained the familiar Mustang profile, with the GT cars, receiving grille mounted fog lights. Special styled steel wheels were made for the 2+2 fastback models. Interestingly, even though the styling changes increased the size of the new car, the overall effect seemed to make the car actually look leaner. Changes to the interior were minor, with the addition of a strange looking "safety" horn button cover and changes to the dash, including round "rally pac" style gauges integrated into the instrument panel. 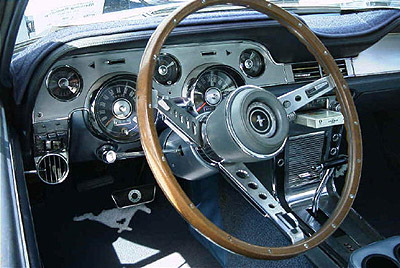 One of my favorite additions to the 1967 Mustang Fastback's interior appointments, was the tilt away wheel, familiar to early T-bird fans. 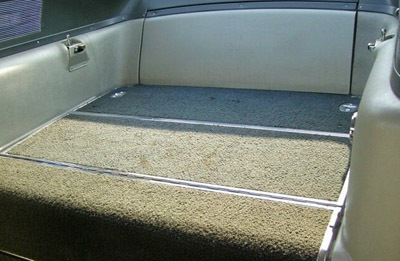 Whether you needed to, or not, it just looks cool to move the wheel out of the way before you exit the car! A limited slip differential was available to help get all that power to the ground. And if you ordered the Gt Equipment group (V8 engine cars only) you could also order a competition handling package, including beefed up and firmer suspension pieces as well as special 15" wheels. As many Ford pony car enthusiasts know, the 1967 Mustang fastback was also the base for the famous Bullitt, from the old Steve McQueen movie "Bullitt". And judging by what you'll see at any car show these days, there are a lot of people out there that wanted one of their own.